After a longer hiatus TROLL returns. The basis of the band is the quite reputable Nagash (ex. DIMMU BORGIR, THE KOVENANT). True black metal is promised; cold keyboard-laden melodies, high-pitched and speedy guitar patterns and Nagash´s demonic voice. Ten hymns to Old Nick awaits, welcome to hell. “Til Helvete med Allt” opens in fine and well arranged fashion. The keyboards make me forget the dreary drumming and the typical guitar work has a suitable position in the mix. As a whole this works fine. The feeling of darkness and chaos is present and run by Nagash. “Allt för Satan” provides a neat, rather thrash-inspired sound, but the keyboard is a must for the overall sound picture. There are hints at too much frenzied guitar work and an unhealthy lack of keyboards, as in “Gå till Krig”. But that is temporary and TROLL is normally better than that. “Burn the Witch” is more metal and lacks a distinct black metal vibe, the same scenario as with IMMORTAL`s latest outing. TROLL is probably better musicians than is average in the genre. The title track is a fast piece that breaks away from the mould. The lyrics are mostly in Norwegian, but a few exceptions in English are present. TROLL impresses me mostly. 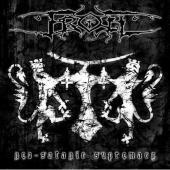 TROLL contributes to the necessary improvement and higher musical standards of future black metal. With albums like this one a band is not constricted to a few faithful, and I believe that a wider audience can be found from now on.